If 3D printing becomes half as big as the hype suggests, then getting your children interested in this new technology could be a worthwhile endeavour. Fortunately, there are thousands of fun things to 3D print with your kids out there. Desktop 3D printing’s aptitudes lie very much in the toys arena, and therefore numerous 3D printing models of this type have been developed. However, the problem we are all facing, is that for every 10 brilliant things to 3D print, there are probably 1,000 “not so brilliant” things to 3D print. Fear not though, I have taken the time to locate 18 fun things to 3D print with your kids, that fall into the brilliant category. 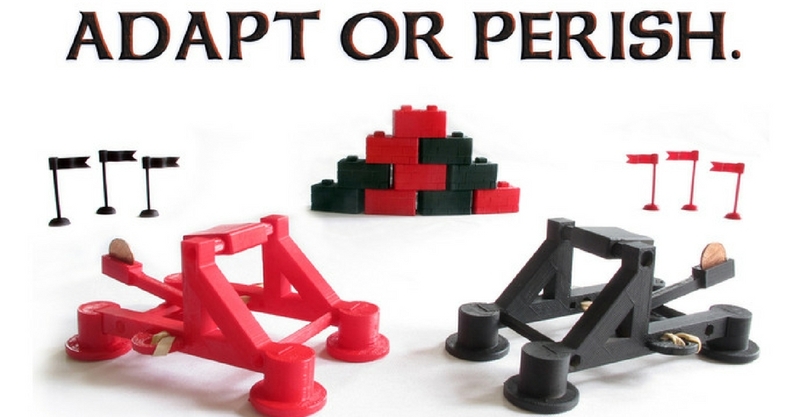 It is up to you as a parent, to decide how suitable these 3D printing models are for children! This is not the first time I have written about a Tulio Laanen 3D printing model. 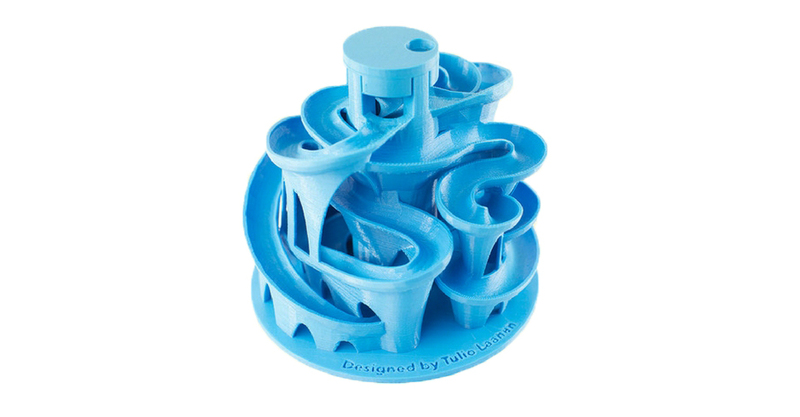 One of his 3D printed Marble Machine’s made our best 3D printing ideas list. Now as far as fun things to 3D print with your kids go, this is an excellent one to kick off the list. It’s nice and simple to print, involves some minor assembly, and is great fun to play with once you have built it. 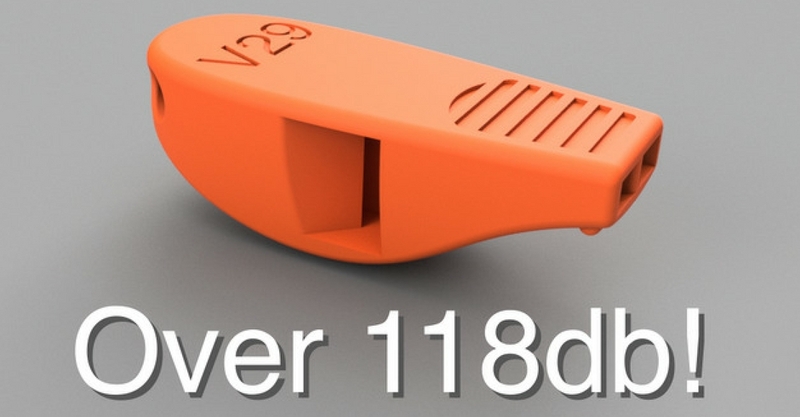 There is a demonstration video, and over 100 makes on Thingiverse. However this is an easy print, requiring no support material, and no rafts. Just make sure you have the build volume for it: 140 x 140 x 120mm. Oh, and some spare marble’s lying around. Of all the fun things to 3D print with your kids, why choose something that will make them louder. I don’t have a great answer for that, other than the fact that I printed this Whistle, and it is so much fun. For those of you who don’t work in decibels, it is really loud too. In fact it took no less than 29 version to get it this loud. The print is really quick and simple. Just be sure to send them out to the garden to play with it. 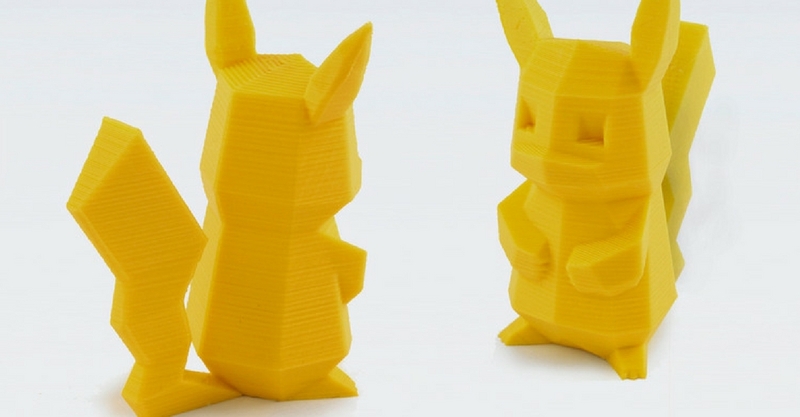 There are actually six of these 3D printed Low Poly Pokemon’s available. Save yourself the trouble of going out and hunting for them with your smartphone, and just print them at home. They each print in under one hour, and offer endless amounts of fun for kids. A really nice way to get the younger ones interested in 3D printing. Now time for a home grown 3D printing model. 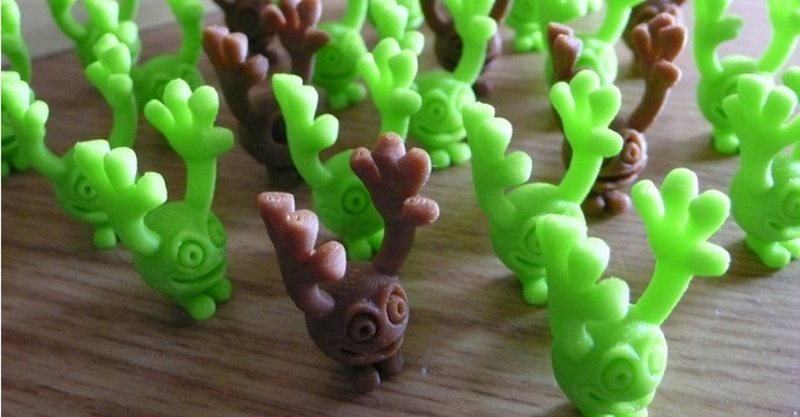 As you may know, LayerTrove specialises in fun things to 3D print. Carefully designed and optimised for desktop 3D printing, our 3D printed Bart Simpson is definitely a fun one for the kids. The printing couldn’t be simpler, no rafts and no supports. Plus you get the enjoyment of slotting all the pieces together. In addition to Bart, we also have an entire collection of Simpsons characters, just waiting to be printed. Fun things to 3D print can also be educational too. The perfect combination when you are involving your kids. 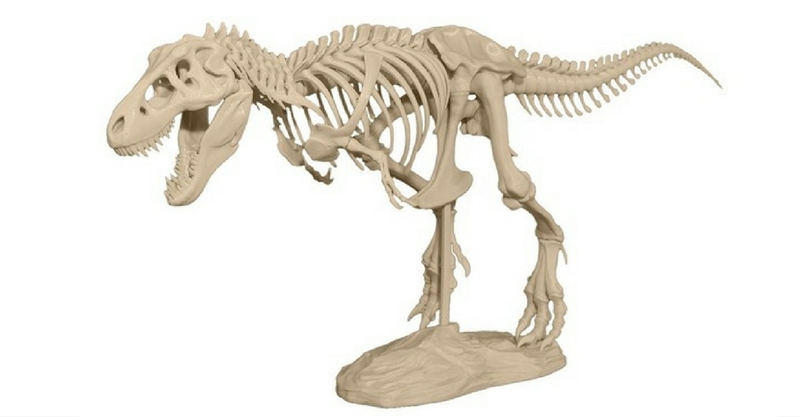 The 3D printed T-Rex Skeleton was created by none other than Makerbot. Makerbot put some real effort into this 3D printing model, making it relatively straight forward to print and assemble, but also very accurate in the details. 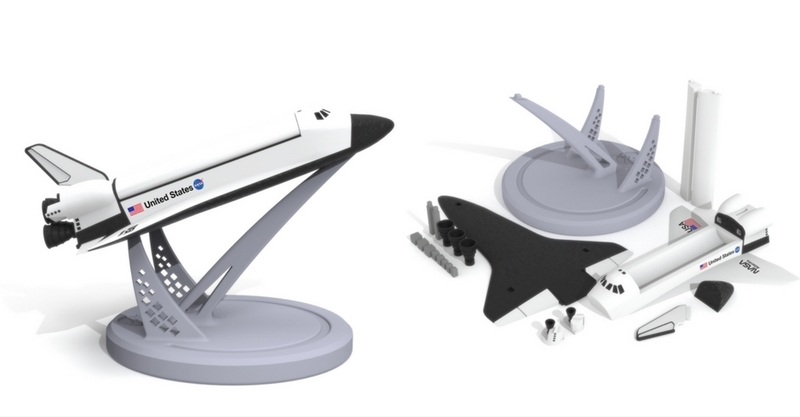 The design comes complete with pdf assembly instructions, and a useful time-lapse assembly video. You can also download some other Makerbot created Skeletons, if the T-rex proves popular. 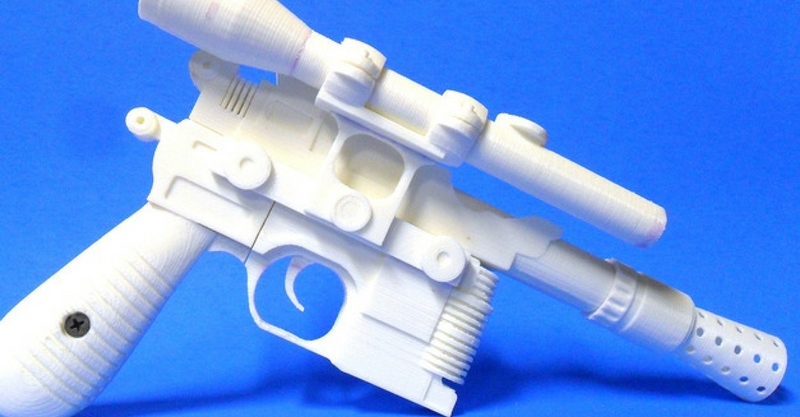 I always said we would never have a 3D printed gun on LayerTrove. And here I am suggesting one as a fun thing to 3D print with your kids. Given that it’s a prop from a popular movie franchise, and that most young boys like to play with toy guns; I guess I can let this one slip. The 3D printed Han Solo Blaster looks awesome, and if you are good with the paints, you can create an exact movie replica. The print is a bit more challenging though and you will require some screws and some glue. Now these are genuinely fun things to 3D print. They’re like Lego for the desktop 3D printing generation. Cleverly called 3D printed Linklings; as you may have guessed, they link together to form a chain. Designed by David Hagemann from Germany, I think these little things are pure genius. You can even buy them from Shapeways, if you don’t own a desktop 3D printer. And if you do, just load up your print bed and let it run. Your kids will have hours of fun, creating Linkling towers, and whatever other ideas they can come up with. Who doesn’t love Walt Disney characters. Especially the original Sensational Six. 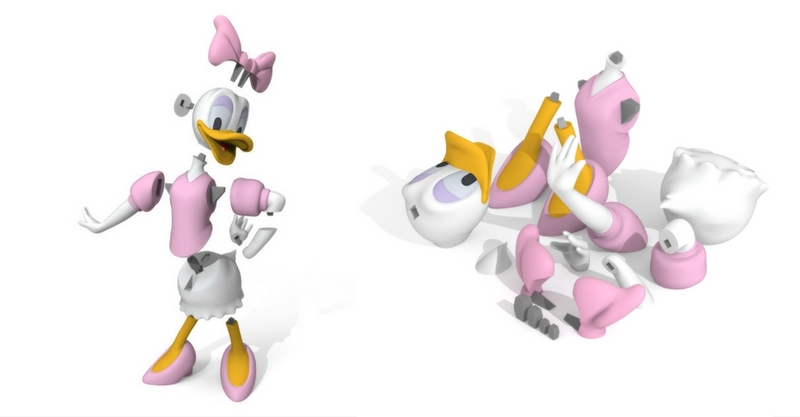 Put our 3D printed Daisy Duck on your fun things to 3D print list. Like all of our 3D printing models, it has been designed and optimised specifically for desktop 3D printing. Don’t believe what I’m saying, download a free sample and test the quality for yourself. Support free printing goes together with fun and simple assembly. In addition to this, the rest of the sensational six are currently under development, and will be available to download soon. Another excellent offering from Makerbot. The 3D printed Hydralon The Hydra Dragon. A little bit difficult to pronounce, but very easy to print and assemble. It prints in seven different parts, not including the joints, and then clips together. The details are fantastic, and if you like to paint then you can get some great results. In addition to this, should it prove popular with your kids, Makerbot has developed an entire collection called the Dragons of Glastonbury. There are twenty three 3D printing models altogether, which should give you plenty of fun things to 3D print. This one should be entitled, fun things to 3D print with your teenager. 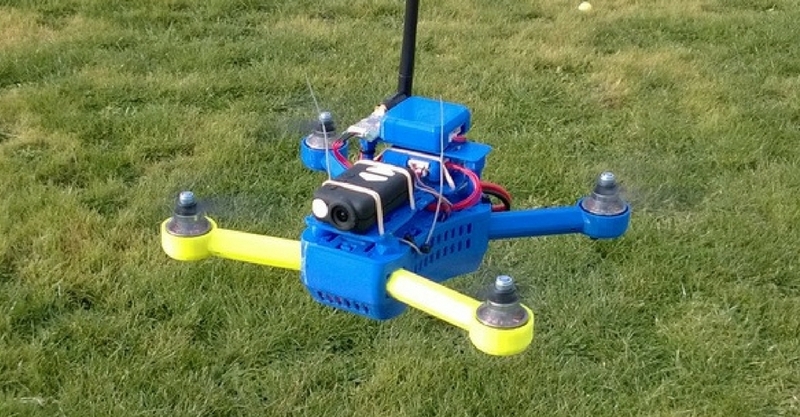 Quadcopters and 3D printing go together perfectly. If this is something that interests you, then you should check out my article on 3D printed drones. There are so many to choose from these days, but this one is my personal favourite. It’s definitely not a simple project, and does require a lot of effort, not to mention an array of non printed components. But the results are awesome. Take a look at this video, to see just how awesome. You should always be a bit sceptical, when you see things to 3D print with articulation. Most desktop 3D printers struggle to create the tolerances required, to get 3D printing models like this to work. One hundred microns seems like a high tolerance, but compared to conventional manufacturing, it’s not. 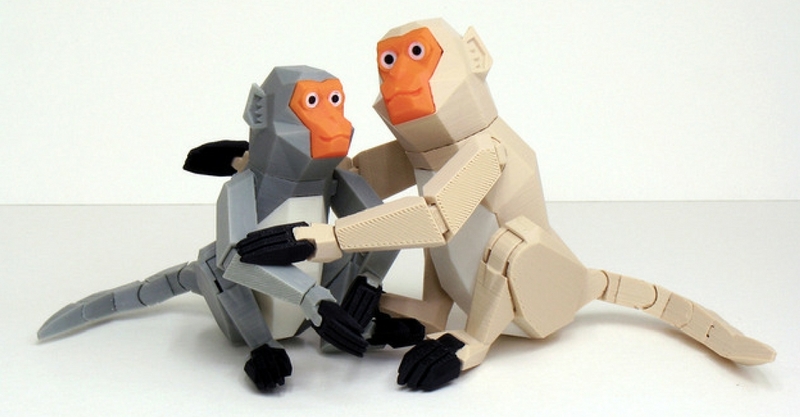 However, there have been plenty of successful makes of this 3D printed Formosan Monkey on Thingiverse. And the assembly video gives you great confidence, that all the parts clip together nicely. It’s a good little 3D printing model, and a great effort from Amao Chan from Taiwan. 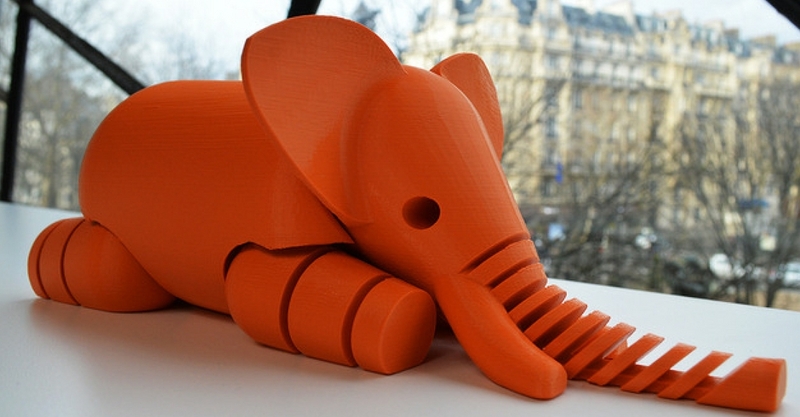 This 3D printed Elephant has been a very popular thing to 3D print. If you have been involved in 3D printing for awhile, then you will almost certainly recognise it. 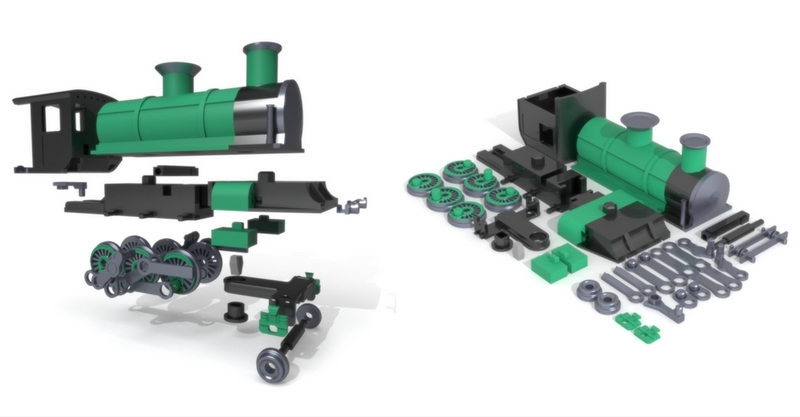 With 120,000 downloads on Thingiverse, and nearly 900 makes, you know that it’s going to be good. It does have the articulation that I warned against, but this 3D printing model has been carefully designed and tested. Created by Le FabShop in Paris, they also have a 615mm tall Eiffel Tower. Might be something else your kids are interested in; assuming you can afford the filament. Of all the things to 3D print, that Makerbot has created, this is by far my most favourite. 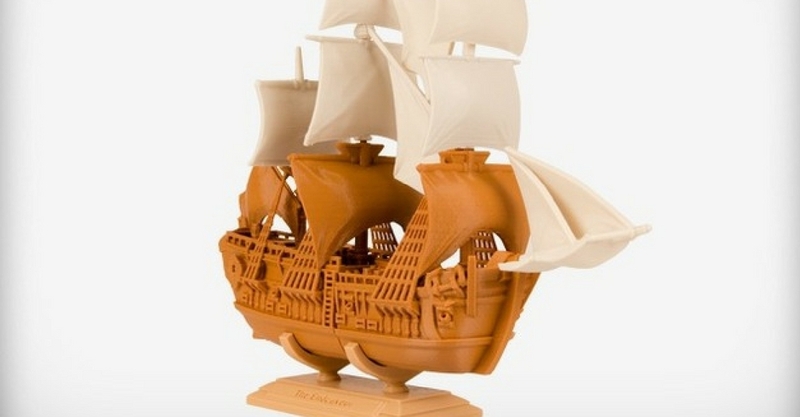 The 3D printed Endeavour, once commanded by Lieutenant James Cook, on a voyage of discovery to Australia. Really nicely designed, with careful thought put into printability and assembly. Great as a historical teaching aid too. What’s even better, is that the Endeavour is part of a collection of historic vessels, called Famous Expeditions. Trust me, your kids will love it. And once you have printed one, you’ll definitely want to print all five. From the high seas, to outer space. Even though the Space Shuttle flew its last mission in 2011, there is something just so cool about it. I was at the Kennedy Space Center last year, and saw this awesome shuttle in the flesh. If you are interested in space related things to 3D print, then we have a Space Exploration collection. Part of this collection is the 3D printed Space Shuttle, complete with opening cargo bay doors. It’s great fun to print and assemble, and even more fun to play with. You can also tell your kids all about Neil Armstrong, whilst you are waiting for the print to complete. I’m not sure how interested a baby is going to be in 3D printing, but at least they can be interested in the result. 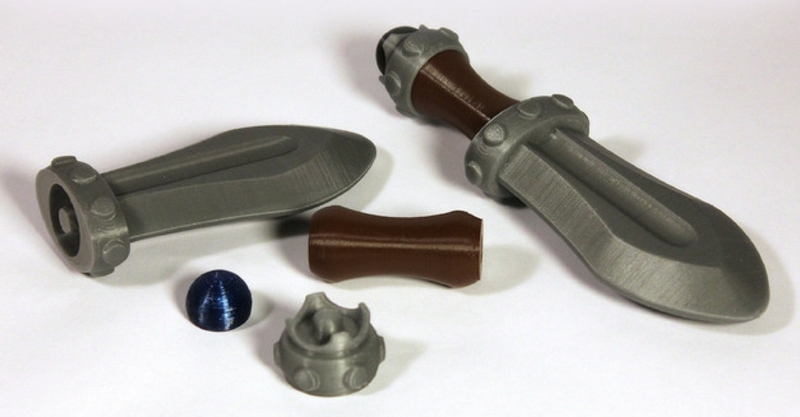 Matthew Harrell from Wichita has done a supreme job, of bringing us the 3D printed Baby Sword Rattle. Awesome creativity and really nicely designed. No supports required during printing, but you might need a bit of glue for assembly. Make sure you watch the instruction video, to see how you get the beads inside the rattle. Parents be warned, anything that comes off a 3D printer may not be child safe! Should the jewel come loose, it could present a choking hazard. Another design for the things to 3D print with young kids list. 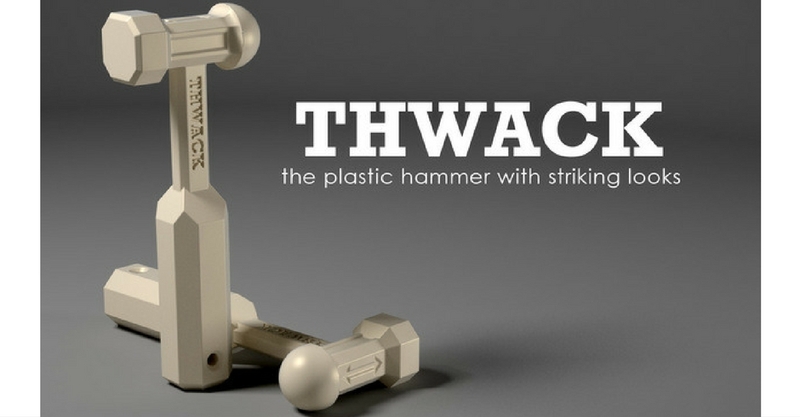 Thwack, the 3D printed Hammer. Obviously not suitable as a working hammer, but great for bashing things in a gentler fashion. Could be useful for getting those Lego Duplo blocks together. Isn’t this a brilliant idea from Jim Rodda. Great fun to print, assemble and play with. The 3D printed Seej Starter Set, is a true open source tabletop war game, complete with written rules and everything. The aim of the game is to topple your opponents flag. If you would like to support Jim, you can by the latest addition of Seej on his website. Last but not least, one from the Jedi Master Daniel Noree; the 3D printed Toy Dump Truck. Daniel is a legend, when it comes to creating things to 3D print. If you are not familiar with his work, then check out his 3D printed Formula 1 Car. 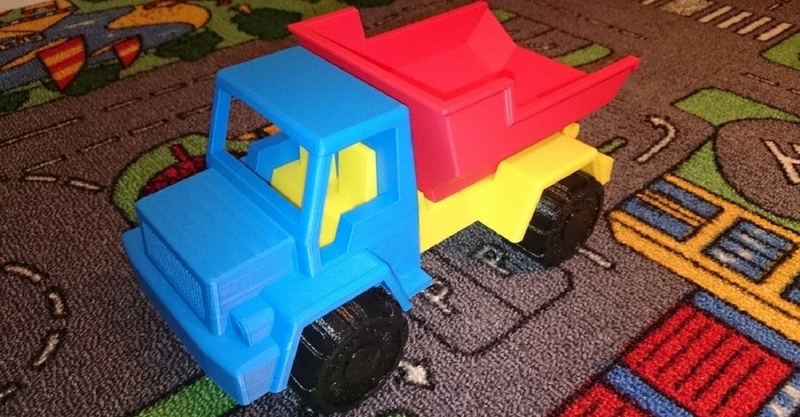 Ok, so the dump truck is not as sophisticated as the F1 car, but your kids will love printing and playing with it. I suspect you probably will too. 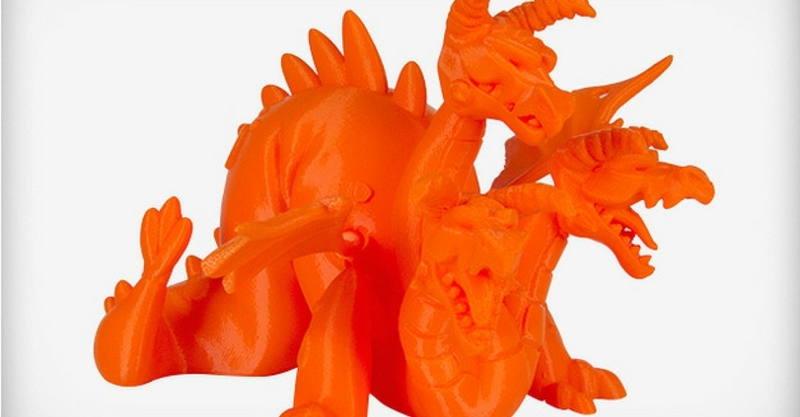 So there we have it, 18 fun things to 3D print with your kids. If you have already bought a desktop 3D printer, or are considering buying one; getting the whole family involved could be a great way to justify the cost. Given that 3D printing is likely to be a big deal in the future, training your little ones in this new skill could be a prudent idea too. 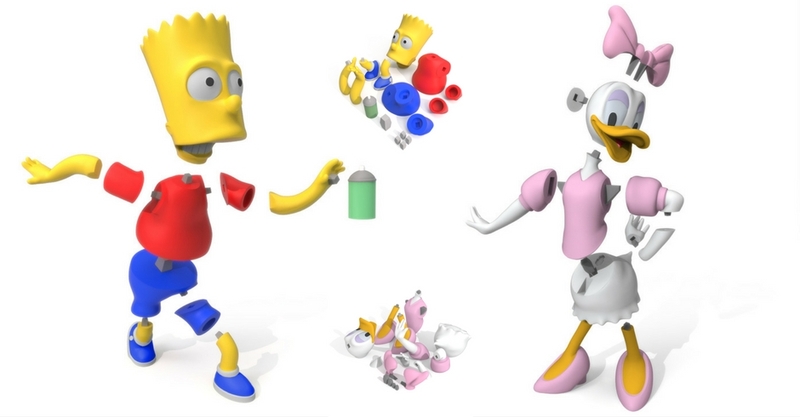 There are also some great 3D modelling software packages, which are ideal for getting your kids interested in design. Either way, I hope you have fun with it. Are there any fun things to 3D print with your kids you think should be on my list? 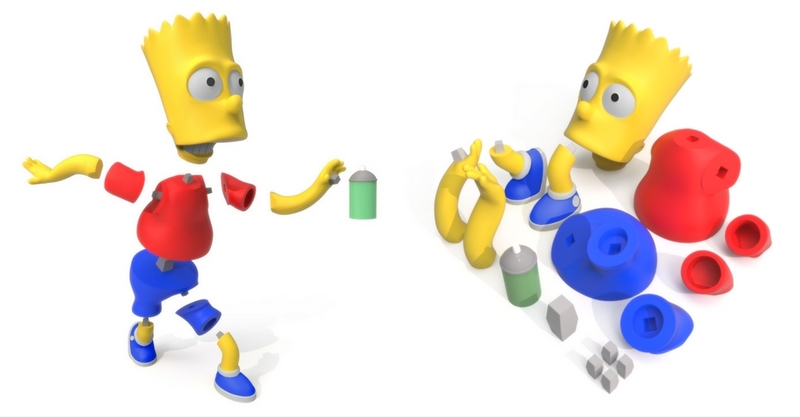 A good resource for searching 3d models for kids is STLFinder. It has more than 25 repositories and locating a 3d model you desire it is fast.